This upholstered item is covered by a 5 year warranty on the original upholstered cover for normal, non-commercial use from the receipt date. Resale, commercial/institutional use and recovering the frame void all warranties. This warranty does not cover damages resulting from misuse, accidents, improper cleaning or accidents. Due to craftsmanship and natural materials, slight variations may occur from piece to piece and are not covered by warranty. Wearing quality, washed fabrics, colorfastness, shrinkage, wrinkling and stretching of fabrics are not covered. Usage of fabric protectors will void all warranty. Leather is a natural material enhanced by its variations. Wrinkles, color variations scratches and natural markings are not considered flaws. Stone, metal and other non-wood surfaces should be cleaned with soft cloths and gentle cleaning products. Use felt pads under objects that may scratch the surface, avoid placing beverages directly on the surface. For spills immediately wipe by blotting. To keep your upholstery in the best condition we suggest simple maintenance, careful cleaning and practical precautions. Place your upholstery properly; avoid placing fabric and leather furniture near heat sources and direct sunlight. Reverse cushions and pillows on a regular basis to keep filling distributed evenly and minimize wrinkles from regular use. Vacuum leather upholstery with a soft brush attachment and dust regularly with a clean cloth. Do not use furniture polish, oils, varnishes, ammonia water, dusting agents or soaps. For soils or stains, thoroughly clean the area of the leather with the spot with lukewarm water. Do dab or rub the stained area. Allow the area to dry naturally and repeat spot clean if necessary. Our Crawford series combines a fresh and dreamy sense of style with a subtle nod to the luxe lifestyle. The designs here are classic, but they pull in a contemporary French influence as well as an updated Hollywood Regency flair. The inspiration behind this look stems from traditional craftsmanship and features modern lines created by diamond, chain-link, and sunburst patterns that are softened with slight contours to create memorable pieces. With solid brass hardware, ivory fabrics, and gold nailhead trims, each piece is dramatic, refined, and makes a personal statement that says: glamorous taste with modem sensibility. Shop the series below to bring a definitive modern energy, as well as a glamorous look, to your home. This little gem delivers compact style. Ivory upholstery on a polished brass frame makes a bright, glamorous statement. 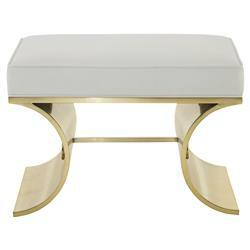 As a footstool or in front of a vanity, this little bench give off a Hollywood Regency vibe. The shape of the frame is sleek and modern. Line up several end to end, for versatile impromptu seating that comes together in a beautiful silhouette.